The spin bikes otherwise known as the indoor cycling bikes have come to be accepted as one of the best ways to workout indoor while feeling the real outdoors cycling experience. You may be wondering what the difference between the upright bike and a spin bike/cycling bike is. The difference is that you can both seat or stand while working out with the cycling bike while you can’t do that with a typical upright bike. By the way, the name ‘’spin’’ is a copyrighted name given to a cycling bike product by Mad Dogg Athletics. Therefore, the official name for a ‘’spin’’ bike is cycling bike because the spin bike is a copyrighted name that belongs to Mad Dogg Athletics. 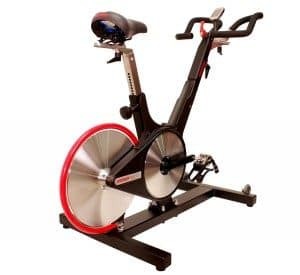 It is also obvious why Mad Dogg Athletics decided to name their cycling bike the spin bike because it is like a cycling bike that is suspended in the air while you spin the wheel. Cycling bike is one of the popular fitness equipment commonly found in the gym today where there are spinning classes and many people have also added one to their home gym as well. But it has always been an uphill task when it comes to finding the best spin bike for home use. For almost 100 years, cycling bike has been in existence and a result there are a lot of brands and models that can really make it difficult in deciding which one to purchase. Having this problem in mind, HTBTB has decided to write a review that should serve as a spin bike buying guide geared towards helping folks like you to settle for the best cycling bike. Like aforementioned, there are a lot of people that love exercising with a cycling bike, which could explain the reason why you may see individuals pushing hard on their cycling bike pedals in the fitness club or the cycle studio gym. It is true that working out in a group can be motivating but having one added to your home gym can even be inspiring; reasons being that you can always climb on your cycle or spin bike and workout without having to worry about what time of the day it is. You can only get motivated when you manage to get to gym and workout with a group of people. But that doesn’t happen often because you might have some constraints that could make it very difficult to visit the gym on a regular basis which is necessary for reaching your fitness goals and staying focused. Therefore, cycling bike for the home gym has become imperative so that you can realize your fitness objectives. We presume you might have figured the importance of a spin bike in your home hence your search for the best cycling bike. Speaking further on the benefits of having a spin or cycling bike at home; instead of driving to the gym for a couple of minutes you can actually use that time to workout at home. Instead of paying for that gym membership fee you can actually cut and save it for a quality cycling bike for home use. Instead of spending money on that gas to drive to the gym you can actually save it up by having one spin bike at home. Moreover, most inconveniences that are encountered when having to go the gym must have been resolved once you have a cycling bike at home. Thankfully, you can easily order a quality cycling bike online and have it delivered to your doorstep within a day or three depending on your location. A retailer like Amazon does the heavy lifting for you when it comes to shipping fee because that is free and they will deliver it right in the room you intend to use it or want it to be in. Again, the indoor cycling bike is a great way to enhance your overall health and fitness at home no doubt about that. If you think you need a fitness instructor just as you would get in the gym, then get fitness DVDs or have some downloaded from the internet/YouTube and have it viewed via your TV or computer while practicing it out as well. We value Amazon customer reviews because that is first-hand reviews that come from actual users. Therefore, for those spin or cycling bikes that might have a good number of Amazon customer reviews and good approval ratings they should be considered as good cycling bikes. One of the ways to enjoy and get the most out of a cycling bike is the ability to get the unit suit you. And it can only suit you if you can make some adjustments to some key features like the handlebars and the seat. Being able to adjust the seat forward/back or up/down can really make the machine comfort to your body so also the handlebars as well. Just like with any other fitness equipment, the console is a very important aspect of the cycling bike. If an indoor bike is equipped with a good console or monitor then you will be able to monitor your workout progress by viewing such data as the resistance level, pedaling time, Odometer, etc. With such workout data, you will be motivated to be focused and try to break your previous workout progress which is essential to achieving your fitness goals. Flywheel weight contributes to the quality of workout you will be getting from certain cycling bike. The heavier the flywheel the better because that would simulate riding on a real outdoor bike and also it provides momentum that keeps the bike smooth and steady while working our vigorously. The resistance has always been one of the important integral parts of any cycling bike. The resistance system of any bike should be critically looked at because that could make or break the fun with your cycling bike. Basically, a user should be able to easily adjust the resistance of the bike without so much hassle. The user should be able to increase and decrease significantly the resistance in order to experience a more challenging or easy workout. Most cycling bikes have the knob as the adjusting mechanism while some have lever depending on the model of the indoor bike. Just as the ability to adjust the handlebars and the seat is important so also the pedals; being able to adjust the pedals can really get your feet the comfort they require while working out. You should be able to know the weight capacity supported by the cycling bike you are interested in. A good indoor bike can at least support up to 250 pounds maximum weight capacity. An indoor cycling bike that is equipped with a water bottle will at least make water handy during a workout. This is very necessary as you may already know that hydration during and after exercise is absolutely necessary. When it comes to preventing heart disease it is by engaging in cardio such as running or cycling. Cycling has always been one of the ultimate ways of keeping fit and losing weight. Any exercise that essentially raises your heart rate improves your cardiovascular health and burns a lot of calories as well. High-intensity workout with the cycling bike for 20 to 30 minutes daily greatly improves your overall health and fitness. You can shed a lot of weight by using a cycling bike depending on your fitness level. You burn as little as 400 calories or as much as 1500 calories per session depending on your workout duration and of course fitness level. Moreover, exercising with the indoor bike improves your body’s metabolism making it possible to even still burn calories after the actual workout. The calories you tend to burn per session with a cycling bike can equal or be more than what some people can eat per meal. There is this believe that indoor cycling bike offers only a lower body workout which is true to an extent but it does work on the abdomen and the arms as well though. You can only argue that the level of impact on the upper body is less to what it offers to the lower body. 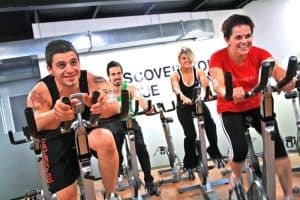 Indoor cycling for 20 to 30 minutes greatly improves our overall well being, that is agreed but it also ignites the release of endorphins that makes one feel ecstatic without actually injecting any form of a hard drug; this is a natural and healthy way of improving your mood without jeopardizing your health for it. Just as we have mentioned earlier that that choosing to purchase an indoor cycling bike for home use will help you to save money by not paying for gym membership and gas for driving to the gym. In terms of convenience, you will be able to workout at any time you want and it is more likely that you will tend to work out more frequently. Bad weather or lack of time will never be an impediment anymore. A cycling bike uses partly upright stationary bike features but usually with a heavy spinning flywheel that has a resistance that is adjustable to provide a certain feel of workout (challenging or easy). The indoor cycling bike has a lot of similarities to a bicycle only that it looks like it is suspended in the air with a flywheel instead of two wheels. To make exercising with an indoor cycling bike complete you need some certain thing as the right outfit, gym shoes and probably virtual workouts to keep you motivated. Just like with all of our fitness equipment reviews we do recommend using the right workout outfit of cloth. You may have noticed that even individuals that are doing professional outdoor cycling use unique clothing that is usually tight fitted. This is not because of beauty or fancy but for safety and comfort while working out. Put on something that won’t get in the way of your workouts like a shirt and a short. The right indoor cycling shoe is required to avoid injury and maintain a certain level of comfort during a workout. Therefore, endeavor to look up one here if you don’t already have one. You may likely need some tutoring when you acquire an indoor cycling bike for home use. Usually, if you are working out in the gym you might have an instructor that could tell you what to do but while at home you need to get some cycling DVDs or even get some downloaded from YouTube there are ample of them out there. By the way, you can still get some quality workout if you can watch something like good movie or music that could get you distracted from the rigor of exercise. It doesn’t require much to maintain an indoor cycling bike. It is a common sense that when you get all sweaty as a result of exercise with it that will spill over to the cycle bike as well and so will require some cleaning after every workout session. Also, clean when not in use because of dust. We are going to help list some of the best indoor cycling bikes that will best suit your needs. There are a bunch of them out in brands and models with different level of features and price. These spin or indoor bikes are selected based on our research and Amazon customer reviews as well. The ProGear 100S Exercise Bike/Indoor Training Cycle has 105 Amazon customer reviews with an approval rating of 4.3 out of 5 as at the time this review was written. Ordinarily, it is not wise to purchase cheap indoor cycle bike because they tend not to be built with quality material and don’t have much of features as well. However, the ProGear 100S Exercise Bike is an exceptional bike that is cheap yet built to last with great features. You can see that evidence by the approval ratings and the Amazon reviews. It supports up to 250 pounds maximum weight capacity and has a chain driven mechanism to simulate road bike exercise. It has a cast iron inertia driven flywheel with a chrome rim that weighs 22 pounds which guarantees smooth and consistent workout experience. Easy dial tension adjustment for more challenging workouts. It has an LCD computer that displays your workout data such as the calories burned, distance, time, speed, pulse and scan. With this feature, you will be able to maintain your target heart rate and be motivated towards achieving your fitness goals. Water bottle holder is also included to enable you to stay hydrated at all times during workouts. Toe cages also included helping with extra forward leg thrust. It has double-direction pedaling which means you should be able to pedal in both directions and it has transportation wheels that make relocation easy. The Sunny SF-B1001 Indoor Cycling Bike has about 352 Amazon customer reviews and an approval rating of 4.1 out of 5. It has a fully adjustable seat, handlebars, and resistance just as we expected. It also has an impressive 30-pound flywheel that could guarantee that smooth and stable workout experience. It is integrated with a heavy-duty crank and steel frame that also ensures durability. Obviously, this unit possesses the very important features that make a spin or cycling bike the very best and moreover it is affordable. Click right here to read our full review. The Sunny Health and Fitness SF-B1110 Indoor Cycling Bike has 473 Amazon customer reviews with an approval rating of 4.2 out of 5. This falls within the price range of less than $300 and it possesses a lot of features as well. Features inertia driven flywheel with chrome rim that weighs about 44 pounds. This is heavy enough to produce a great momentum that translates to smooth, consistent and stable workout. It also has a chain driven mechanism that simulates road bike exercise. It is integrated with cushioned ergonomic seat and handlebars that are fully adjustable. The seat can be adjusted forward/backward and up/down allowing the perfect proximity to the handlebar. The handlebar can be adjusted inseam height max 37’’/Min 29. Supports up to 265 pounds maximum weight capacity and has a stability that allows the user to stand up and pedal simulating an uphill road experience. As for resistance, it has 2 in 1 easy dial tension adjustment and push-down brake that offer the much needed challenging workout. Its felt pad gives smooth and even resistance. It has transport wheels that make relocation a lot easy. The Exerpeutic LX7 Indoor Cycle Trainer with Computer Monitor and Heart Rate Sensors has 151 Amazon customer reviews with an approval rating of 4.1 out of 5 as at the time this review was written. This is a choice indoor cycling bike for anyone on a limited budget and still wishes to experience a challenging workout at home. This cycling bike is made of a solid frame with a beautiful design that also ensures stability. It supports up to 300 pounds maximum weight capacity and its steel and metal built guarantees a powerful performance that is void of noise. It has three position handlebars that feature the electronic heart rate monitor that help you to maintain your target heart rate at all times and during high-intensity workouts and spinning intervals. It has this natural ability to attract you to it for more and more spinning and cycling experience because of its reliable and safe performance. It has alloy pedal construction with secure toe cages which help in terms of extra forward leg thrust. It is integrated with easy dial tension adjustment that guarantees a smooth transition of resistance levels and challenging workouts. The 40 pounds flywheel with chrome rim allows you to experience a smooth and consistent workout. You will also be able to monitor your workout data and progress by viewing such data as the distance, calories burned, elapsed time, and speed and of course pulse via the LCD computer display. You will be able to do a stand up pedaling that simulates an uphill road experience. The seat is well cushioned and can be adjusted 4 ways; forward/backward and up/down for your optimal comfort. It does have transport wheels for easy relocation. The Sunny Health and Fitness Pro Indoor Cycling Bike has 2248 Amazon customer reviews with an approval rating of 4.2 out of 5 as at the time this review was written. This is an indoor cycling bike with 40 pounds flywheel for stability with a heavy-duty crank and chain drive mechanism that simulates a bicycle experience. It has fully adjustable leather seat and handlebars for maximum comfort and body conformity. The resistance can easily be switched up to different levels by twisting the tension knob. Easily increase and decrease to experience an outstanding challenging workout that would help you realize your fitness goals, great for any fitness level. The Phoenix 98623 Revolution Cycle Pro II Indoor Cycling has 76 Amazon customer reviews with an approval rating of 3.9 out of 5 as at the time this review was written. This is the bike for folks that are addicts or passionate about spinning or cycling. It is a very versatile bike in function and can make your workout experience outstanding even as you thrust towards making your fitness goals come true. It supports up to 250 pounds maximum weight capacity and a fully adjustable seat (fore/aft and up/down) for maximum body conformity and comfort. It is integrated with direct-driven resistance system that offers you the opportunity of challenging exercise and a 39.6-pound balanced flywheel that convey smooth and consistent workout experience. The Phoenix 98623 Revolution Cycle Pro II Indoor cycling is a US manufactured bike that is sturdy and adjustable and could almost be used by anyone regardless of their fitness level, size or height. The Indoor Cycling Bike Pro Spinning by L NOW LD-582 has 32 Amazon customer reviews with an approval rating of 3.8 out of 5 as at the time this review was written. This is a bike that does not need the occasional repair or oiling, it is built to last. It has an automotive-grade and patented belt-drive system instead of the usual chain drive system. The advantage of the belt drive system is that it makes the operation of the bike to be a lot smooth and quiet than the chain driven bike. It has LCD monitor that tracks your workout progress by displaying workout data such as the time, speed, distance, calories burned, ODO, RPM, and heart rate by hand pulse. The frame is built with heavy-duty steel and it is integrated with a 46 pounds bidirectional flywheel that gains momentum easily and operates with great consistency and smoothness. It supports up to 500 pounds maximum weight capacity; has water bottle holder for staying hydrated throughout workout session. 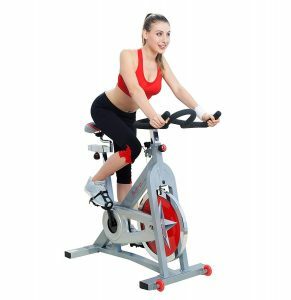 The Spinner Sprint Premium Authentic Indoor Cycle-Spin Bike with Four Spinning DVDs is a product manufactured by Mad Dogg. Currently, as at the time of writing this spin bike buying guide, it has 12 Amazon customer reviews with an approval rating of 4.2 out of 5. This bike can legally be called the ‘’spinning’ bike because that is the copyrighted name given by Mad Dogg Athletics but most people now refer to every other cycling bike as spin or spinning bike. That being said, Mad Dogg is one of the manufacturing companies that made cycling bike so popular and if you decide to buy this cycling bike it could last you for a long time because it is commercially built. It has a heavy duty 43-pound flywheel that provides a consistent and smooth workout plus a chain drive system that also offers the road bike exercise experience. It has optimized Q-factor at 155mm which rivals good road bikes. For the fact this product was made by Mad Dogg is already a very good selling point for some people. For better ergonomics, the fixed handlebar has been angled 5 degrees up from horizontal. You will also enjoy and get motivated with the four spinning workout DVDs that accompany the machine. The Sole Fitness SB700 Exercise Bike has 153 Amazon customer reviews with an approval rating of 4.1 out of 5 as at the time this buying guide was written. So far by the Amazon reviews, it is obvious that this exercise bike is one of the best indeed. This cycling bike has been reported to be on the same level as most of the bikes you find in the gyms. It supports up to 300 pounds maximum weight capacity with a heavy duty 48 pounds flywheel that offers a consistent, smooth and quiet workout. The frame is solidly built with a lifetime warranty. It has a computer display that tracks your workout progress such as time, speed, distance, calories burned, and RPM. The console is compatible with wireless heart rate chest straps that allow the user to view the most accurate heart rate data which also enables them to stay within their target heart rate zone at all times. If you are looking forward to purchasing a quality cycling bike for home use that falls within this price range then you need not look further because you are just about to experience a realistic workout experience of all times. The BodyCraft SPT-Mag Magnetic Club Group Cycle has 7 Amazon customer reviews with an approval rating of 4.8 out of 5 as at the time this spin bike buying guide was written. This is one of the cycling bikes that is rated highly by cycling instructors. It is also great for home use, however, the name BodyCraft may not ring a bell to so many people just like Sunny Health and Fitness or Mad Dogg would but they do have a reputation in the manufacturing of good and outstanding spinning bikes. This machine can accommodate and support users of up to 350 pounds weight maximum capacity with its heavy duty frame. It is incorporated with guards that would keep sweat off the machine’s flywheel thereby prolonging the lifespan of the bike. Moreover, it uses eddy current magnetic resistance technology designed to respond to your actions instantly which also provides a very challenging workout experience. It is built and warranted for club use even as you can also use it for home use as well. This goes to show how strong and durable this machine is. The handlebar features multiple position hand grips that include racing handle grips. For optimal comfort, the seat and handlebars are fully adjustable forward/backward and up/down for perfect fit for most different individual sizes. The BodyCraft SPT-Mag Magnetic Club Group Cycle has a belt drive system that makes it operation or workout to be smooth, quiet and maintenance free. The Keiser M3i Indoor Cycle is one popular cycling bike that has received so many positive reviews from Amazon customers. If budget is not a problem for you then we would definitely recommend the Keiser M3i Indoor Cycle bike because it will worth every penny you will be spending on it. You may probably notice the use of this machine in your local gym or in most group spinning classes that is because it is durably built and endowed with great features one cannot just refuse. It is strong enough to withstand regular use by multiple users, that is one of the reasons why it the darling of gym owners. It has an excellent transition when the resistance level is being adjusted and it is great for all fitness level because of its 24 magnetic resistance levels. It supports up to 300 pounds maximum weight capacity. The seat and the handlebars provide a maximum comfort because of their ability to adjust and conform to the user. It has other features such as the beautiful Backlit Bluetooth computer display that has the ability to connect wirelessly to your smartphone or tablet device and display vital workout data such as the time, distance, RPM, heart rate and more. We have managed to list the best spinning/cycling bike with a price range on this buying guide. However, we are going to pick our top 2 from low and high budget cycling bikes to help you further make a quick decision on purchasing the right spin bike. The Sunny Health and Fitness Pro SF-B901 made it to our low-budget cycling bike top pick for an obvious reason. First, it is easy to tell that this is a very popular cycling bike because of its 2,248 Amazon customer reviews and still maintains an approval rating of 4.2 out of 5. This machine is available within the price range of less than $300 and still possesses impressive features. It is solidly built with a heavy-duty crank. Both the seat and the handlebars are fully adjustable which means that you can easily be at home with the machine as you enjoy the comfort it offers. It also has a chain drive system that simulates road exercise bike experience. It weighs about 108 pounds and supports up to 275 pounds maximum weight capacity. The 40 pounds flywheel guarantees stable, consistent and quiet workout experience while it simulates the momentum of a road bike exercise. The Keiser M3i Indoor Bike made it to our top 2 just as you may have probably guessed. This machine is a beauty and a sleek looking bike that can ordinarily attract you to work out it even when you are not planning on doing so. More so, Amazon customer reviews and rating has proven that it users love it and are recommending it. This is the type of high-end cycling bike you should consider purchasing because it has got features that could make your workout highly effective and enjoyable as well. It is also important to mention that this machine is manufactured in the U.S with great quality. Click here to read our full review. Using spin or cycling bike is one of the best ways to experience a cardiovascular workout that is still gentle on your joints. With the right spin or cycle bike, you are bound to enjoy exercise and also easily achieve your fitness goals. The listed spin/cycle bikes on this buying guide will definitely provide you with the right challenging workout experience. Do not hesitate to ask any questions you may have because we shall be more than willing to help in whatever way that we can.